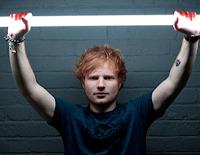 Ed Sheeran covered Bruce Springsteen's "Atlantic City," on the Zane Lowe show on BBC Radio One earlier this evening. The "Lego House" singer also performed tracks from his long-awaited new album X (out June 23rd worldwide) as well as cuts from his 2011 debut full-length. You can listen to Ed's cover and watch his performance of "One" and "Sing" below.